The vineyards are located in the Mediterranean on the plateau of Beaucaire, where they benefit from both northern and southern sun exposure. The Rhône River is just a few miles away, and the vineyards are covered with galets, the same round flat stones that are famous in Châteauneuf-du-Pape. The vineyards have been certified organic by EcoCert since the 2011 vintage, and meticulous care and attention are paid to these vines; overall management, including crop thinning and pruning, are all carried out by hand. Organic fertilizers are used, and treatments are kept to a minimum. Whites and rosés are fermented and aged in stainless steel tanks; the reds are fermented in cement so that there is an oxygen exchange, and are then aged in cement or barrels depending on the cuvée. 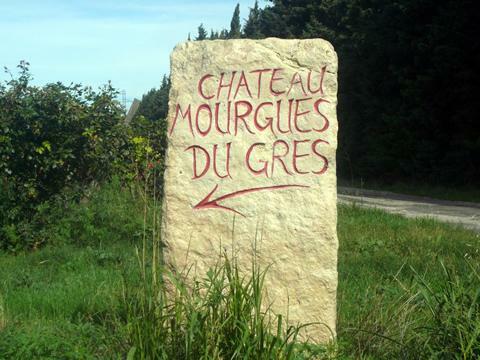 Mourgues du Gres is recognized as one of the very best estates in the Costières de Nimes in the Revue de Vin de France, Guide Hachette, and Gilbert et Gaillard. Each bottle shows the emblem of the sundial that is on the wall of the winery, with the words "Sine Sole Nihil," which translates to "There is nothing without sunshine." For Mourgues du Gres, this symbolizes the maturity and harmony of the wines.